This MP3 file is from the album Icarus / Andrew Ford. Duration: 11 mins, 49 sec. Recorded/performed at: ABC Studio 200, on 30 Mar 99. Score & Part: Contemporary Australian violin : thirteen compositions for solo violin and violin and piano / edited by Lawrence Whiffin. CD: Like Icarus ascending : violin and piano music. 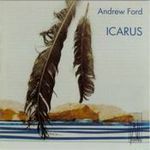 CD: Icarus / Andrew Ford.